I have a problem – or rather several of them – with both the Guardian’s decision to commission the recent ‘Comment is Free’ article by Andy Newman on the subject of Gilad Atzmon and his new book and some of the subsequent reactions in the blogosphere, as well as with the article itself. Several commentators on what I would call the sane centre-ish Left (which is also where I place myself politically) have welcomed Newman’s ‘outing’ of Atzmon as an anti-Semite and his supposed drawing of attention to anti-Semitism within the ranks of the far-Left. But is that the whole story, or are these reactions somewhat myopic? First, let’s consider the dynamics of the publication of the article itself. Gilad Atzmon is clearly a very extreme case; one would have to be either terminally intellectually challenged or willfully blind in order to not recognize his anti-Semitism and yet Andy Newman is now feted in Left-liberal circles for stating the in-your-face obvious. Why? The second question is why Andy Newman? The man is something of a political butterfly, having flitted between various sub-factions of the far-Left including the Socialist Workers Party and George Galloway’s Respect before most recently ending up in the Labour Party. 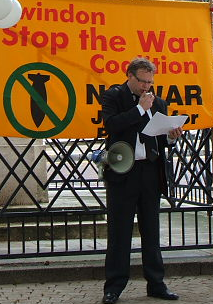 He is a prominent member of the Swindon branch of the Stop the War Coalition – an organization which regularly collaborates with Islamist fascists on projects such as ‘Al Quds Day’ and itself has a despicable history of promoting anti-Semites. On October 8th it will be holding a rally in central London at which known supporters of the anti-Semitic (and proscribed) terrorist organization Hamas such as Anas Altikriti and Mohammed Sawalha are billed to appear. In other words, inviting Andy Newman to rubber-stamp Gilad Atzmon’s anti-Semitism is a bit like asking Nick Griffin to write an article denouncing Combat 18. So what was the point of Newman’s article? Well, the conclusion we must reach is that Gilad Atzmon is simply such an egregious example of a crude and blatant anti-Semite that he has become an embarrassment even to the sections of the far Left which promoted him for so many years. Atzmon went too far, and the far-Left is now in damage-control mode because it cannot afford to be associated with someone who has torn the fig-leaf of ‘anti-Zionism’ into tiny pieces. But in denouncing Atzmon for what he clearly is, Newman aims to achieve a secondary gain; in effect he is trying to recreate the smoke screen between anti-Semitism and anti-Zionism which Atzmon destroyed. This brings us to another, but related, subject. Who gets to define anti-Semitism? Why did the Guardian appear to think that Andy Newman could give a more authoritative opinion on the subject than, say, a representative of an organization such as the CST which deals with anti-Semitism day in and day out? There’s a problem here which I believe is, to a certain extent, of our own making. Thinking back to my active days in the British Feminist movement of the 1970s, I am struck by one very obvious fact: we never fell into the trap of allowing men or those annoying Babycham-sipping women in pink, who sat in designated areas of the pub declaring “Of course I’m not a feminist” whilst furiously batting their curled eyelashes, to define what was or wasn’t sexist. Surely we cannot accept that white people should have a monopoly on deciding what is racist or that straight people alone should get to decide what is homophobic. So how did we get to the current situation in which, by and large, a non-Jewish opinion on what is or is not anti-Semitic carries infinitely more weight? I would suggest that we got there because we have been too polite and too reasonable. We have, in our millennia-old efforts to survive as a minority, outsourced the thorny issue of anti-Semitism because somewhere down the line we came to the conclusion (perhaps correctly) that we could not fight it alone. The downside of that outsourcing is that we are no longer the majority stakeholder on the issue and so we believe that we should be grateful when someone such as Andy Newman – with his terrible record and associations – throws us a crumb. And a crumb it most certainly is. Anti-Semitism has blighted the far Left for decades; there is nothing new or ‘rising’ about it at all. From its very beginnings Socialism advocated the assimilation of Jews as an ‘answer’ to anti-Semitism rather than dealing with the problem itself. The only scenario under which a Jew could liberate himself from racist persecution was, according to Lenin, “when the non-native sections cease to be alien and blend with the general mass of the population”. In other words, Jews could only avoid anti-Semitism if they stopped being Jews. Not only has this theory been proved drastically wrong both in fascist Nazi Germany and – more relevantly – in the Soviet bloc, but it is difficult to imagine a modern-day socialist exhorting other groups to free themselves of prejudice and discrimination by becoming what they are not. Is the answer to sexism for women to become men? Is the answer to homophobia for Gays to repress their sexual orientation? Should black people suffering from racism just have done with it and become white? Obviously, we now enter the realms of the ridiculous, but Socialist attitudes on the far Left have remained trapped in this anachronistic way of thinking when it comes to Jews. The progress made over the past half-century or so on the issues of equal rights for groups such as women, Gays and people of colour has been the result of liberation campaigns organized, defined and led by those groups themselves, together with (usually later coming) support from liberal thinkers. Zionism is the Jewish liberation movement; its foundations lie in the recognition of the need for Jewish self-determination because history has proved beyond all doubt that Jews could ultimately never rely on the will of the majority in their host countries to either tackle the issue of anti-Semitism effectively or afford protection from it. That – unfortunately – is still true, even in the most ‘enlightened’ of countries. Many years ago I had a T-shirt which stated on the front that “Feminism is the radical notion that women are human beings”. The same applies to Zionism; it is the (still, for some) ‘radical’ notion that Jews are equals and that as such they are, like any other nation, entitled to dictate their own destiny through self-determination. A Left which is anti-Zionist is a Left which denies the right of Jews to that equality, and therefore racist. So when Andy Newman and others of his anti-Zionist ilk begin defining anti-Semitism as something as patently extreme and obnoxious as Gilad Atzmon and his latest bid for fame as the producer of a modern version of the ‘Protocols of Zion’, I become suspicious. Not only am I in no need whatsoever of Newman’s guidance or endorsement in order to be able to identify anti-Semitism for myself, but what worries me more is the fact that the Andy Newman Guardian-approved version of anti-Semitism in fact opens the back door to far worse abuses because, in confining anti-Semitism to such an extremist as Atzmon, it actually removes other forms of anti-Semitism – such as those practiced by anti-Zionists – from the debate. This indicates that Newman – like many others – is in a state of denial as regards the anti-Semitism of the far-Left and its popular manifestation as anti-Zionism. That should be a cause of deep concern for all the authentic Left liberals who have showered him with their congratulations for this article: a man who does PR for Hamas like Newman in the above video is not ‘concerned’ about anti-Semitism. His state of denial should also, of course, disqualify Newman and others with similar records from being considered authorities on or definers of anti-Semitism. If those of us on the liberal Left really do wish to ensure that the Jewish liberation movement is more than a passing phenomenon then we must take responsibility for it and ownership of it. We must stop being nice, polite and passive: gratefully scurrying around to catch the opportunistic crumbs tossed by those such as Andy Newman. He and the far Left in general have not been brought to some Damascene moment of repent by Gilad Atzmon; they merely need to remove him from their sphere of activity for pragmatic reasons. It is time to say assertively that the anti-Zionism of the far Left – although much less flamboyant than Atzmon’s crude anti-Semitism – is no less racist, no less offensive and to bring to public attention the fact that it should be an anathema to all those who truly believe in the liberal principles of universal human rights and equality. Masterful, Hadar! Thanks for such a powerful and incisive essay. From where I sit this is a great, and long-awaited, article, Hadar. I’ve alighted on the above comment simply because I believe we have taken this approach, but must realise that we are long past a point whereby the single, defensive, lets-explain-ourselves position is viable. There is no need to be impolite – I would say ‘assertive’ and ‘confident’ are the traits to aim for. No more apologising! I have studied (for lack of better words) the manner in which speakers such as Christopher Hitchens and Douglas Murray make their points and without exception they are strong and confident. Whether or not one likes or agrees with either, it has to be said that they are both very intelligent men with a gift for clear-headedness. However, these traits alone are not necessarily why they are held in regard. They differ from other intelligent, clear-headed speakers because they state their case with confidence and conviction. And, to be frank, courage. To paraphrase Murray, it is important to state the truth, whether it is popular or not, because in doing so you begin to pave the way for others to do the same. I know that I do go on somewhat, Hadar, about the importance of NAMING such things as antisemitism for what they are, and in this respect I very much agree with Penny, above. Your article goes a long way towards encouraging that and is long overdue. Once such things are “named aloud” they cannot be unsaid. For far too long many Jews have been too apologetic, too supine in the face of insults and slanders, as a result of which, as you say, others rather than Jews themselves have been allowed to define what constitutes Jew-hatred and to undermine and hijack the public discourse about it. I agree with Penny about assertiveness rather than aggressiveness, but it is high time that that particular worm turned and as decisively as is necessary. I agree with you that the anti-Zionism of the far Left is as racist as antisemitism and about Newman’s rejection of Atzmon’s antisemitism being purely for pragmatic reasons rather than because it is morally abhorrent per se. I hope that your article brings this home to those who are still on the sidelines. One of the reasons, as I see it, for the outrageous situation that is being allowed to continue unabated is that there is no cost incurred. No jobs on the line. No compensation for insults etc Having said this, it is extremely difficult to formulate a prescriptive means as to how one may effectively pro-actively move in to pre-empt hateful attacks. Exposing a bigot seems to achieve little and in some cases gives accreditation. It is the great protective mantra of the Destroy Israel Lobby that anti Zionism is not antisemitism. Having said it they can be as antisemitic as they like, although mostly they remember to say Israeli or Zionist when they introduce memes straight out of the Middle Ages or Der Sturmer. Their Arab allies usually don’t bother with this subterfuge. Having Andy Newman (BTW does he speak ‘as a Jew’?) condemn an obvious nutcase as Gilad Atzman will simply be brought up as evidence for the mantra. One of the other great protective mantras (thank you, degee for that phrase) is that people should not be particularist, they should be universal. “Why a Jewish state? Why not just a state for people?” While this is not my own ideology, or not uniformly, it’s a reasonable approach. However, in practice, Israel is, in fact, the only nation attacked in this manner, and particularist tribal groups from many many other places and contexts are regarded not only as acceptable, but deserving of the support and even admiration of other communities. The distinction, of course, comes from the dishonest re-imagining of Israel and the global Jewish community as a dominant, highly empowered group–therefore its self-definition, self-determination and self-defense can be lazily classified as being racist, in the same way sensible people tell Stormfront to shove off with their paranoiac fantasies of oppression. I understand how the thinking works, I just don’t have a good way to break through it!! In our time, every one has the right to fairness, tolerance, equal treatment and justice – except for the Jews. There the right to all that stops and attacks are launched on them – their right to their beliefs, their right to live where they wish and their right to live. What every other nation and people under the sun take for granted must be denied to the Jews. There exists a sort of exclusionary principle about the Jews. They the universal Other of mankind and are not viewed as a part of humanity. Not in the past, not today and certainly not in the future. I rated this comment (the comment to which this comment of mine is a reply) with five stars. However, I did so before I read the following sentence that is in the comment, and if I had read the following sentence before I rated the comment, I would not have rated the comment. What will happen in the future is up to us. Very interesting article – even though Andy Newman might have been thought (not necessarily for good reasons) to be someone who might convince sceptics to shun Atzmon – because you might more normally expect to find him arguing that x or y criticism of Israel was *not* antisemitic – it didn’t seem to work that well, judging by too many comments below the piece. I believe, that detail about far-right antisemites was edited in by a Guardian editor, by the way. Thanks Hadar for this interesting and thoughtful article (and of course for the link). I hope to respond to it more fully later. In the meantime, I was interested that you are suggesting the Graun commissioned Newman to write this, rather than that he wrote it off his own back. I haven’t been following this as closely as I’d have wanted to, so might have missed the obvious, but what makes you say this? Re Another Joshua, I don’t think Newman writes or is seen by anyone as writing “as a Jew” like Greenstein, but again maybe I’ve missed something! I’m not privy to the dynamics, of course, but even if Newman did submit this piece under his own initiative, it was still a Guardian editorial decision which brought it to publication. I don’t think who approached who really matters. Yes, the Guardian made an editorial decision to publish, and who knows how much sub-editing they did. But I think it matters to the analysis whether they thought it was something to commission an article on, or whether Andy thought it was something worth writing about and persuaded them. The epithet I (and not only me)give to Greenstein who so often puts himself forward “as-a Jew”, is augmented by my adding “socialist”. Greenstein , like Andy Newman, as- a -socialist, has sought to distance himself from Atzmon’s kind of socialism, by his piece in the Guardian. Sorry if I misunderstood you Joshua. I agree about the writing “as a socialist”, altho not sure why that’s a problem. He is surely a lot more representative of socialists than Atzmon and right, as a socialist, to be embarrassed. Socialism may be a religion and identity for some people, but it is also a political position so I don’t see the problem writing “as a socialist”. I agree with Hadar about the rather selective approach to which antisemitism to criticise (he doesn’t criticise Arab antisemitism in the anti-Zionist movement). More thought out response to Hadar hopefully to follow later! The point is it makes no difference from what direction antisemitism is coming from – right or left. The “as a Jew” or “as a socialist” or both combined put their political or religious identity in front of their opinions as if to disavow a particular position. But it doesn’t in the case of anti-zionism. There are very few non-racist anti-zionists. Those anti-zionist who are non-racist fall into a tiny group of people who dissociate from any form of national identity whatsover, and speak against the principle of national identity. Some socialists will be within that category. BUT beware of those who do, because for the sake of political argument those who do invariably choose Israel as the means to best illustrate their cause. Conversely, to be a non-racist anti-zionist one should equally be anti-Palestinian in all its forms to qualify as a non-racist. I agree with your point about Atzmon. He’s everything from as-ajew to holocaust denier. Nothing to do with reality or truth. It is my firm belief that one’s observations should inform one’s politics and not the other way round. A very slow reply. I would qualify this”Conversely, to be a non-racist anti-zionist one should equally be anti-Palestinian in all its forms to qualify as a non-racist.” I would say this is correct if it is Palestinian nationalism that is equally opposed as Zionism and not Palestinians in general. Has SU posted anything at all about the killing in Darfur? You know. The Muslim killing Muslim place. Well – there are many perhaps who would have problems with this particular question-begging grouping of words. What percentage of the following might be considered ‘sane’? Jack Dromey MP • Helen Goodman MP • Peter Hain MP • Claude Moraes MEP • Jean Lambert MEP • Farooq Murad, Secretary General, Muslim Council of Britain • Edie Friedman, Executive Director, Jewish Council for Racial Equality • Michelle Stanistreet, NUJ General Secretary • Steve Hart, Political Director, Unite the Union • Megan Dobney, Regional Secretary SERTUC • Zita Holbourne, PCS NEC • Bob Lambert, co-Director, European Muslim Research Centre • Jody McIntyre, Journalist • Peter Oborne, Journalist • Dilowar Khan, Director, London Muslim Centre • Alaa’ Samarrai, VP Student Affairs, Federation of Student Islamic Societies (FOSIS) • Kanja Sesay, NUS Black Students’ Officer • Nitin Sawney, Musician • Sabby Dhalu, Secretary, One Society Many Cultures • Weyman Bennett, Joint National Secretary, Unite Against Fascism • Martin Smith, National Co-ordinator, Love Music Hate Racism. An interesting and really informative article. Andy Newman seems an idiot. I love the video where he talks of 80% palestinian women achieving the equavalent of A levels and how he wishes it was the same in this country. Well the “occupation” can’t be so bad then can it really!